When Sam Witwicky (Shia LaBeouf) finds another shard of the destroyed Allsparks, he draws the attention of the Master of the Decepticon to himself and starts a fierce war of the Decepticons against the Autobots and their Earth allies. Sequel stuffed with action, but less fun. Autobot-Leader Optimus Prime with Sam Witwicky (Shia LaBeouf). After Sam Witwicky (Shia LaBeouf) and his girlfriend Mikaela Banes (Megan Fox) have saved the world from the threat of the evil Decepticons and their leader Megatron with the aid of the good Autobots, the Earth is a peaceful place again. The last splinter of the Allspark is concealed safely, the remains of Megatron lie in a deep oceanic trench and are guarded by a military fleet, and around Optimus Prime and his Autobots the task force NEST has formed, which hunts down the scattered Decepticons. Because there is no need for Sam’s help any more, he wants to lead a normal life again and go to College. Mikaela prefers to stay in their hometown, which amounts to a long-distance relationship. Packing together, an undiscovered shard of the Allspark falls from his clothes and brings the kitchen appliances to robotic life. Sams car and Autobot protector Bumblee destroys the Witwickys’ recently renovated house. Sam gives Mikaela the shard for safekeeping. Sams Parents bringing there Son to the College. Without Mikaela and Bumblee Sam goes to college. His hedonistic roommate Leo (Ramon Rodriguez) operates a website devoted to conspiracy theories and alien cover-ups and tries to come on to their fellow student Alice (Isabel Lucas). But Alice hits on Sam, who wants to be faithful to Mikaele. After a Decepticon tried to steal the shard, Mikaele drives to Sam’s college and catches him in bed with Alice. Alice turns out to be a Decepticon, too, being after Sam because of his visions of cyberglyphs, which come ever stronger after he has touched the Allspark splinter. The cyberglyphs point to a place on Earth where a long forgotten secret is being kept. In order to revive Megatron, captivate Sam and destroy the Earth ultimately, the master of the Decepticons, the Fallen, is on his way to Earth. The Fallen is coming to get ya! 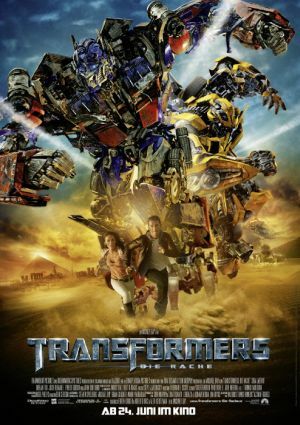 When the first instalment, „Transformers“, hit cinemas worldwide two years ago, it became a success, because it impressed with a quite balanced mixture of humour, romance and action as well as a great serving of charm and novelty. Now “Transformers: Revenge of the Fallen“ opens in theatres and this time director Michael Bay strikes the audience dead with a gigantomaniac, excessively long spawn. The proportions have changed enormously for the worst: higher budget, cheaper humour; many more robots, less character; substantially more action, less keeping track; more mindlessness, less charm. 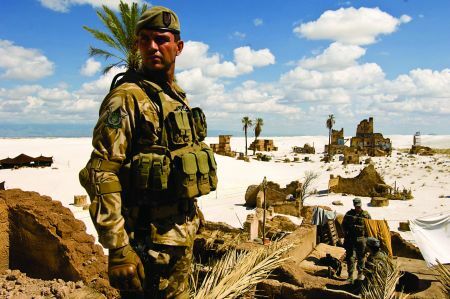 Although the film superficially offers more, “Revenge of the Fallen” seems spoilt in the end. Sam and Mikaela (Megan Fox) running away from the Decepticons. Because of the extensive action scenes, the outcome of which known from the start due to missing surprises, the audience’s enthusiasm is exhausted pretty soon. With so many robots (about 60) it is difficult to follow the clashes and to understand whether the good or the bad ones are under fire. Already at the beginning of the movie it becomes obvious that less heart, but more technique and technology was at work here. That’s the reason why Sam’s mother Judy, played by Julie White, is more hysterical and maniac, why Sam and Mikaele’s relationship is pure skirmish, and especially why the sexual pestering is cruder than crude. In order to get to the vast matériel battle as quickly as possible, human emotions and credibility gets sacrificed to the point that the spectator is reduced to a gawking robot himself. 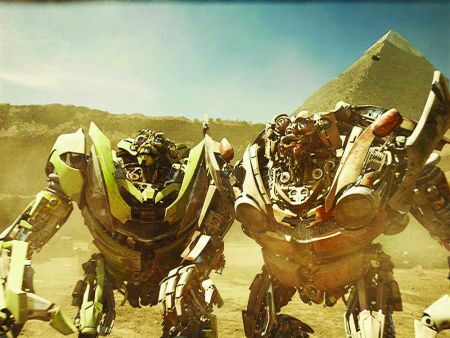 The Twin-Autobots Skids and Mudflap in front of the Pyramids of Giza. Even the justified doubt in the story around the Allspark shard, which sets everything in motion, spoils the film party. Why does Sam give the second splinter to Mikaele and puts her in danger? Why does Sam trust his friend Bumblebee so little that he does not give him the shard to let Optimus Prime use, hide or destroy it? It is really nice that Michael Bay was able to cast all the actors from the first instalment again. But they are incapable of keeping up with the superior number of computer-generated characters and their fights, which have been thought up again by screenwriter duo Roberto Orci and Alex Kurtzman („Star Trek“, „Mission: Impossible III“) on the basis of Hasbro’s toy franchise. What Industrial Light & Magic boasts with strikes everything dead.